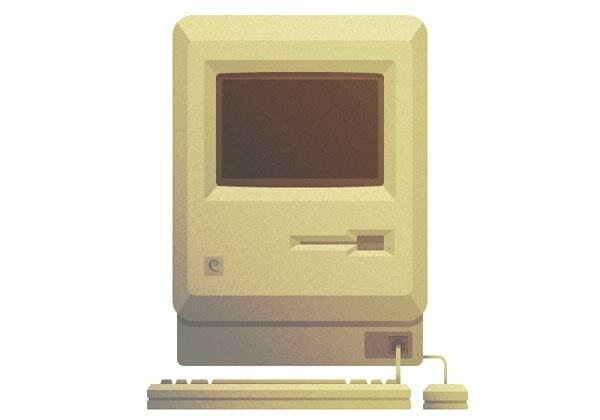 Hi guys, if you’re a tech geek like I am, I know you are absolutely going to love this neat tutorial on how to create a vintage looking Macintosh, using Adobe Illustrator. Also make sure that the Align New Objects to Pixel Grid checkbox is checked as we want everything to look as crisp and clean as possible. Quick tip: if you’re new to the whole pixel perfect process you can read more on the subject in one of my previous tutorials that will teach you all you need to know in order to understand and grasp the technical steps behind any pixel perfect design. As we will be working with gradients, textures, and a large number of objects, I found it much easier to layer the entire design so that we won’t have to use and abuse grouping and isolating objects which would make some steps more difficult than needed. You should have something like this. As you can see, I’ve locked the layers that I won’t be working on, as this helps focusing on just the layer you need. You might be wondering why I said “building”. Well, wonder no more! 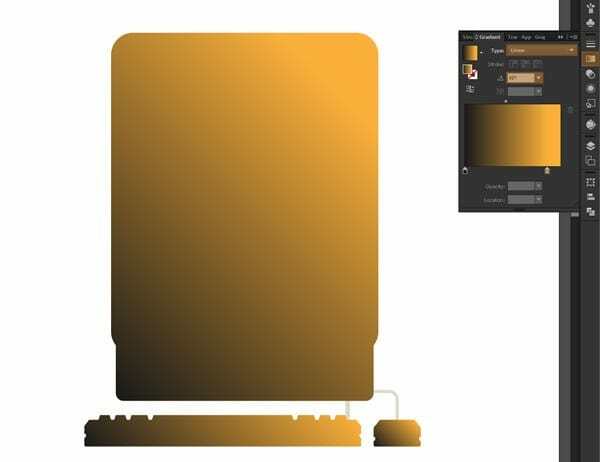 Instead of picking colors randomly, or using RGB/ HSB values we will create our base color palette using the Blend tool. and from the new box, where it says Spacing, select Specified Steps and input the value 8 in the empty field, then click OK.
With both of the squares still selected, go to Object>Blend>Make, then expand the blend by going to Object>Expand>Fill and stroke. You should now have a smooth 9 color palette that flows from light to dark values. Quick tip: in order to know which colors to apply to the different parts of the design, I would recommend numbering them as you see bellow so that you won’t mix the ones which have similar values. 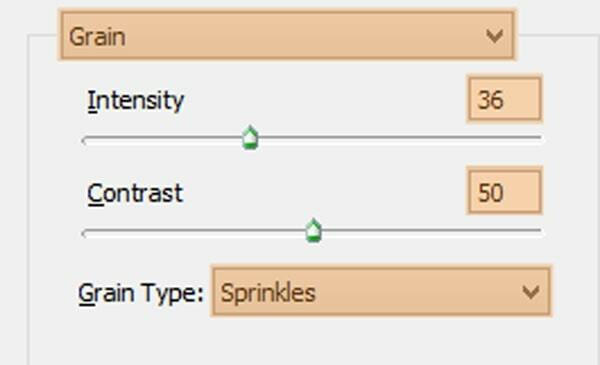 To easily apply a color value from a number to one part of our design we will be using the Eyedropper tool – I will show you how in just a few moments. 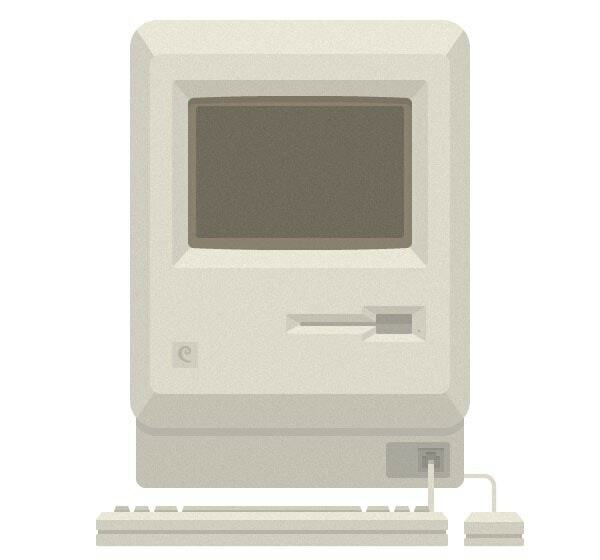 Now that we have set our colors, document size and all that stuff, we will move on to building the actual Mac. As we progress through our process, you will lock the previous layer you worked on, and then unlock the one above it so that you won’t lose track of the layer you’re currently on. position: w: 531px / y: 574px. 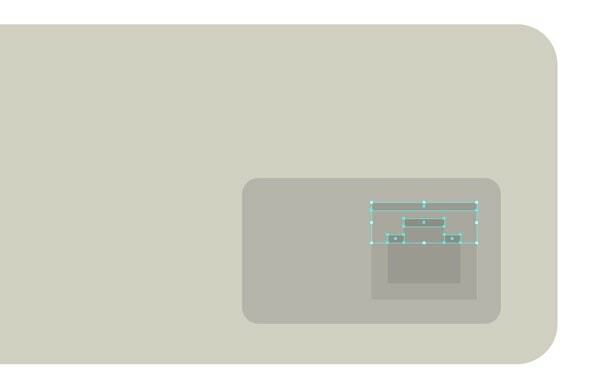 In order to give it a sense of depth we will add some simple shadows by creating 1px rectangles and positioning them above the 3 center objects. Then create another 300 x 340px object with a corner radius of 12px and vertically and horizontally align it to the previous one. Give it a lighter color using number 2. 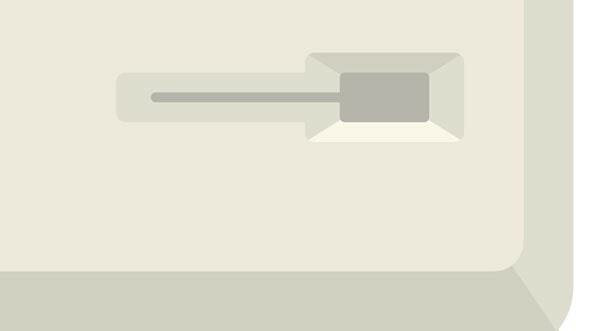 As the objects needs to look more realistic, we will add a lighter and a darker section to the top and bottom of the main rectangle. Now with the Direct Selection Tool (A) select its left lower anchor point and then go to Object>Transform>Move. 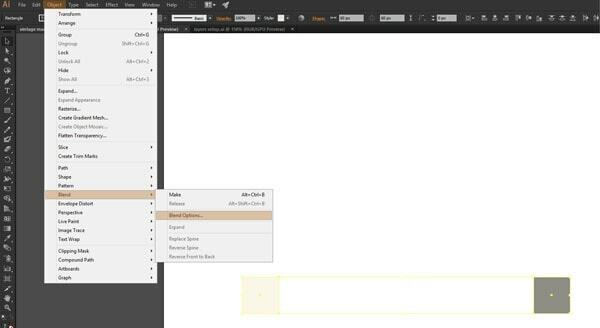 In the new pop up box, enter 30px for the Horizontal field and 0 (zero) for the vertical one. Do the same for the right lower anchor point, and you should have something like this. 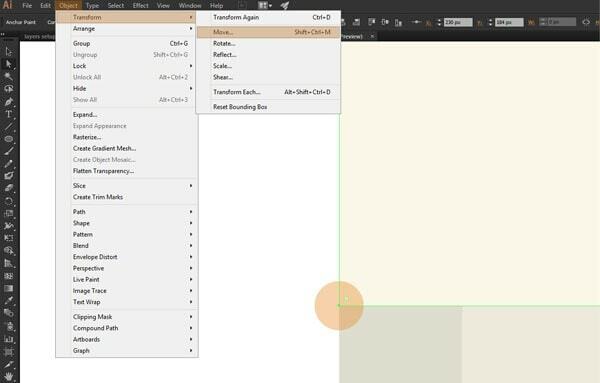 Now copy the big rectangle underneath it and paste it in front so that you can select them both and create a clipping mask (right click>Make Clipping Mask) in order to hide the top corners that go outside. Duplicate this masked object, then flip it horizontally (right click>Transform>Reflect>Horizontal) and change its color using the value from number 4. Select both the lighter top section and the dark one at the bottom, group them and then position them underneath the center object. As you can see, the lower section has the same color with the Mac’s bottom part so we need to add a shadow in order to separate the two. 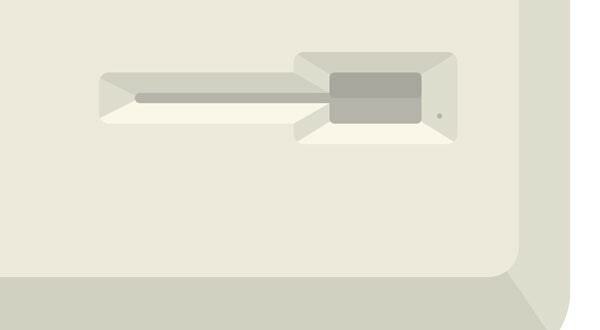 First copy the largest object on the mac top part layer, paste it in place and move it down 8px using the Object>Transform>Move function. Then copy the main body from the mac bottom part layer and paste it on top of the object we previously moved. With both of them selected, create another clipping mask, and then color the object using the value from number 6. If you’re on the logo layer, you can either add the official Apple logo or go wild and make your own. In my case I went with something else. Quick tip: you can easily find the apple logo in a vector format by searching for the following keywords “apple logo vector”. position: w: 456px / y: 444px. At this point you should see something like this. To create the bottom lighter portion, select the masked object, flip it horizontally and then change the duplicate’s color to the value from number 1. As before, we need to create a clipping mask by copying the object underneath in front. Then we can flip the new object, and change its color using the value from number 1 to get the lighter segment. position: x: 400px / y: 294px. Next we need to add the darker and lighter top and bottom segments. Grab the rectangle tool (M), create a 256 x 20px object and color it by picking the color from square number 4. 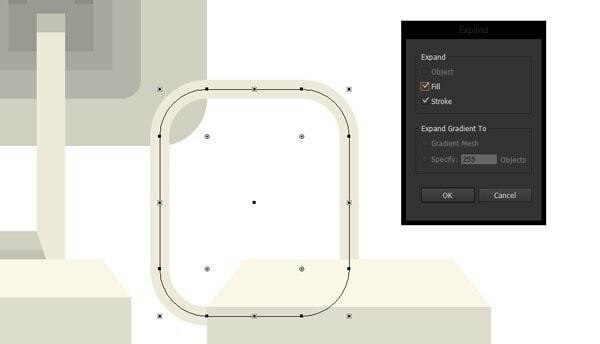 Using the Direct Selection Tool (A) in combination with the Object>Transform>Move function, nudge both the left and right lower anchor points towards the center by 18px. In order to mask the top outer corners, copy the rectangle underneath, paste it in front and create yet another clipping mask. For the bottom lighter segment, just duplicate the top one, flip it horizontally and then color it using square number 1. 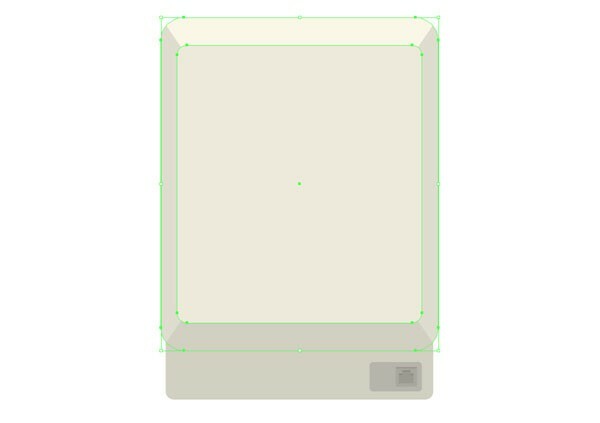 For the darker section that normally shows the information, we will create a 208 x 132 rectangle with a corner radius of 4px, color it #6B6457 and then vertically and horizontally align it to the previous object using the pathfinder panel. The final piece that we need to add at this step is the top shadow created by the frame. To do that, just copy the bulged objected created previously, paste it in front twice (ctrl + F on a pc, cmd + F on a mac), move the one above 6px down on the vertical axix and then using the minus front option in pathfinder delete the lower section. Then select it and change the color to an even darker shade of brown #877E6E. This will act as the base for our keyboard. Next we need to add the center darker part. 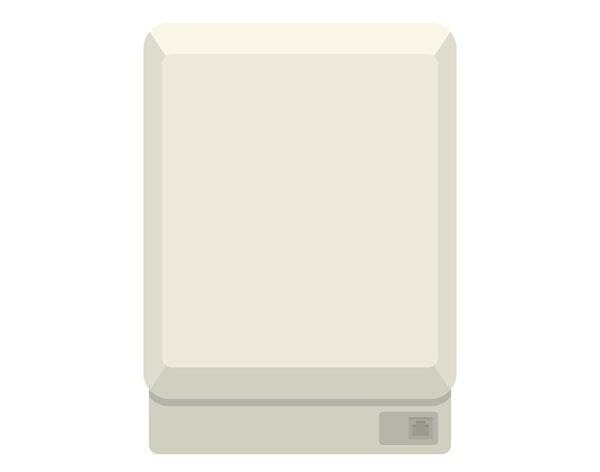 Grab the rectangle tool (M) and make a 348 x 4px object which we will color using number 5. Position this element on top of the previous one and vertically center them. Then add another 352 x 10px rectangle, color it using number 3 and position it above the previous two objects. You should have something like this. For the top part of the keyboard, just create a 352 x 8px element, move the top anchor points 6px towards the center and make sure you change the color to number 1. When it comes to the keys, we will create a base version and then increase the length to create the other two. position: x: 222px / y: 629px. Next duplicate the key and position it on the right side at a distance of 4px. Change its color to number 3 and then duplicate this one and position it the same as before. 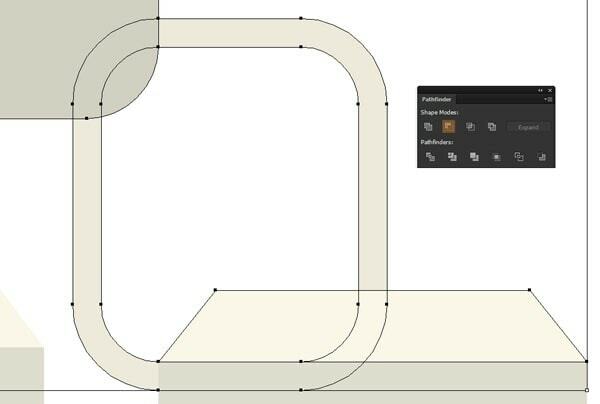 Now grab the direct selection tool (A), select the right anchor points and using the Object>Transform>Move function, nudge them 8px horizontally to the right. The last detail we need to add is the shadow from the bottom. To do so, select all the keys, copy and place them in place (ctrl + F on a pc, cmd + F on a mac), then draw a 320 x 2px rectangle and position it at the bottom of the keys overlapping them. With both of them selected, right click>Make clipping mask. Now to change its color, using the direct selection tool select the shadow and color it using number 5. For the mouse, we will create a smaller base of 60 x 8px with a 2px corner radius, color it using number 3 and position it at a distance of 16px to the right side of the keyboard. Next we will draw the middle darker segment, using a rectangle of 56 x 4px, and position it above the base structure. 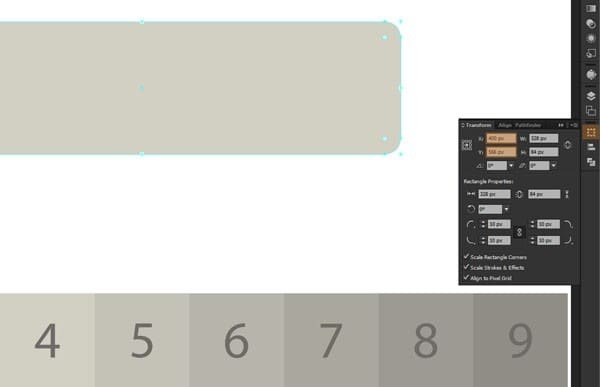 On top of this element we will add a 60 x 12px object which we will color using number 3. 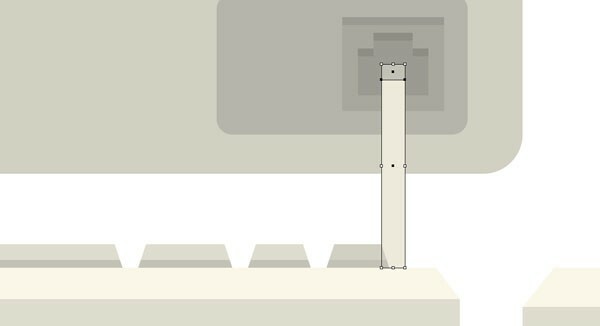 In order to finish the design of the mouse, draw a 60 x 10px rectangle and shift the top anchor points towards the center by 8px. position: x: 531px / y: 606px. Next add a shadow to the top part by creating a 6 x 4px object, position it at the top of the previous element and then color it using number 5. 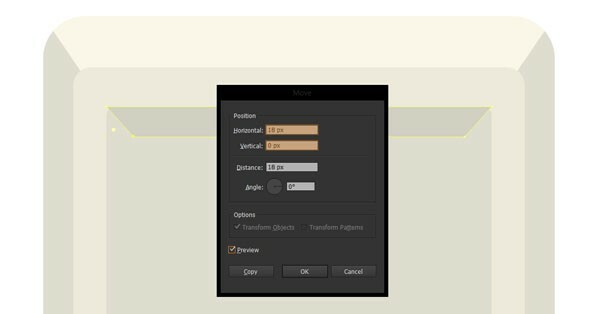 With the object still selected we need to expand it so go to Object>Expand and in the popup box select both fill and stroke. Now we need to get rid of the left and bottom sections of the form. 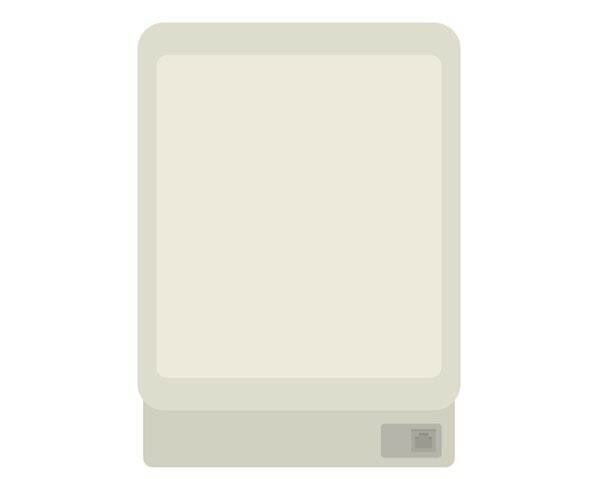 Copy the bottom rectangle from the mac bottom part layer and the top part of the mouse from the peripherals layer and paste them both into the cables layer on top of the rectangle we created above. With all three of them selected, go to the pathfinder panel and click on minus front. As you can see we now have the cable section we need and an unnecessary section that we can delete by selecting it with the direct selection tool and pressing Del (delete). At the end of this step, you should now have the entire Macintosh composed and ready for the “aging” process. Our Mac is almost done, all we need to do now is add some details so that it can tell its real age. 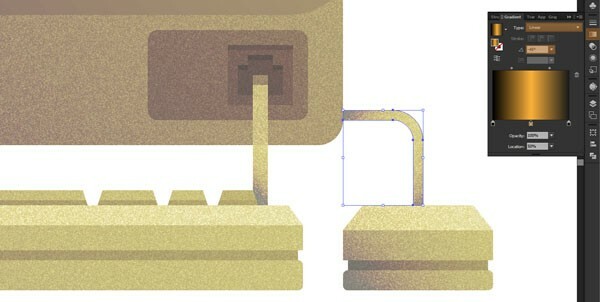 To do so, we will add individual textures to the different components of our illustration. Next go to the Appearance panel and change the blending mode to multiply and lower the opacity to 14%. Do the same for the peripherals, mac top part, and cables. For the display copy and paste in place the top rectangle, change its color to #999999 (R: 153, G: 153, B: 153), apply the same grain texture effect (using the values from above) but instead of multiply change the blending mode to Soft Light and lower to opacity to 50%. It’s a little bit rustier and it’s definitely an improvement over the pure version but we still need to add some effects to get it right. This is when gradients come out to play. 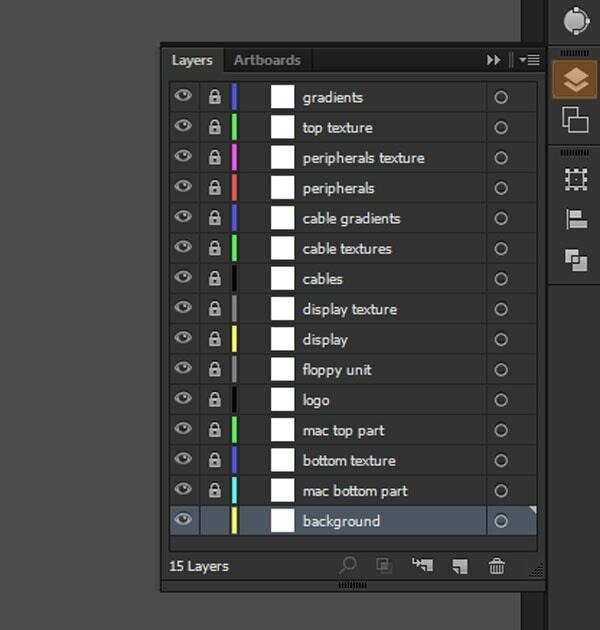 First unlock the gradients layer and then using the direct selection tool copy all the main objects that form both the mac, and peripherals to the above mentioned layer. Select the top and bottom components of the computer and using the unite function in Pathfinder combine them into one object. Do the same for both the keyboard and the mouse. right color: #FBB03B / location: 86%. All we need to do now is change the blending mode to Color Burn and lower the opacity to 34%. As you might have seen, we need to apply the same process to the cables but because the objects need to be layered under the peripherals we couldn’t have positioned their gradients on the top most layer as it would have interfered with the gradient from the keyboard. 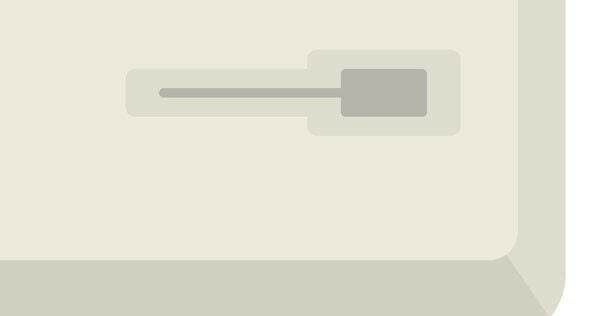 So to fix this, copy the right cable from the cables layer onto the cable gradients one, and create a 6 x 24px rectangle (position – x: 531px / y: 620px) which will cover the section that comes out of the actual mac. Now if before we used the same gradient values for all of the gradients layer, for the last two we will need to adjust them a little. 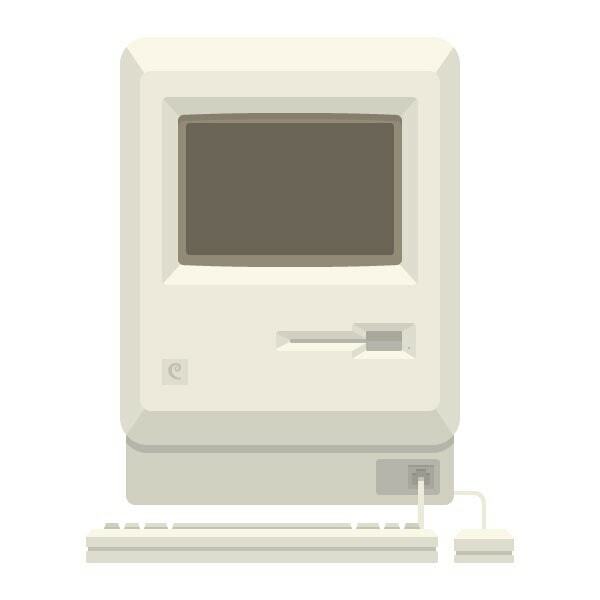 It might have been a long journey but if you followed my steps I’m sure you got yourself a darn good looking Macintosh, and in the process learned some useful tricks that you can use and apply on other projects you might encounter. It’s a quite laborious and time consuming tutorial especially if you have only a little screen, but it’s a very nice illustration, and a very useful method.